The GLORIA Fourier Transform Spectrometer (FTS) is realized as a classical Michelson Interferometer. The optical setup of the interferometer is straightforward and simple: the radiation enters through an insulating double germanium window; amplitude splitting is performed by a dielectric beam splitter on a potassium chloride substrate; two Zerodur cube corners – one fixed, one linearly moveable act as retro reflectors. 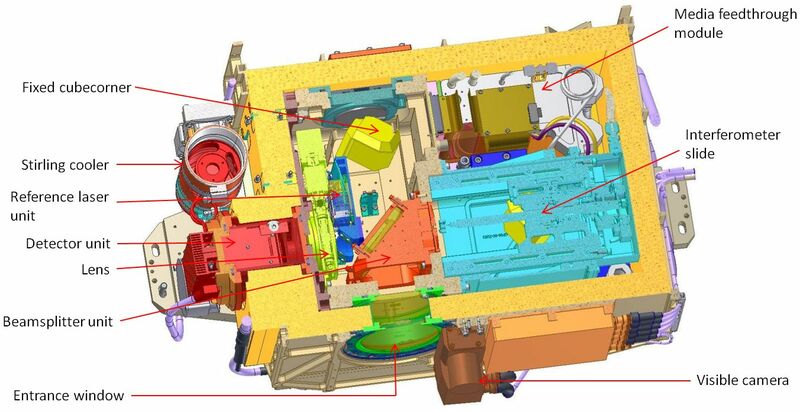 After recombination the radiation is focused on a HgCdTe large focal plane array with the help of an achromatic infrared doublet. The laser reference system is based on a laser diode in the visible spectral domain whose temperature is controlled with a thermoelectric element. Laser detection is performed by a miniaturized quadrature system. 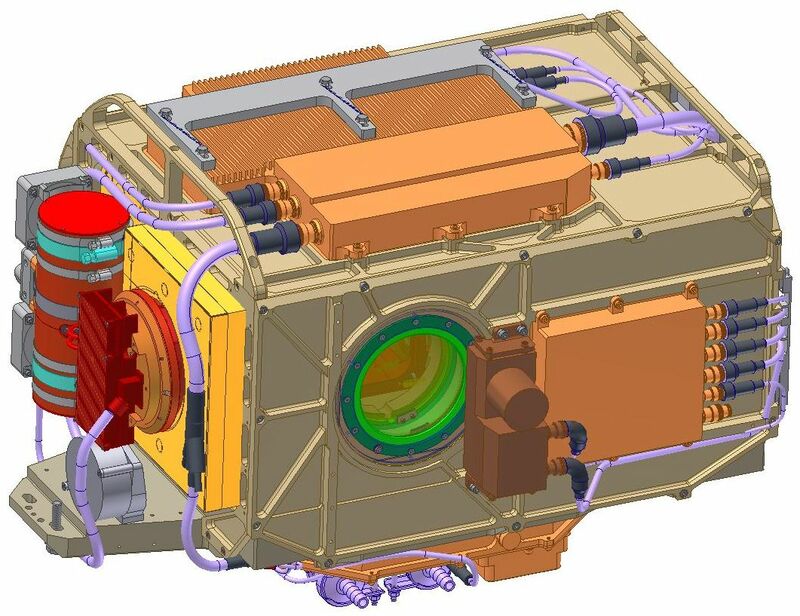 In order to reduce the background photon load and to improve noise performance of the detectors, the instrument is cooled down to cryogenic temperature and maintained around -60°C during operation with a supply of dry ice.The whole system in enclosed with a superinsulating hull. The spectral coverage of the instrument is 770 to 1400 cm-1 with a spectral sampling of up to 0.0625 cm-1. The interferometer is configurable in terms of spectral and temporal resolution, the large focal plane array in terms of read-out area. This gives the GLORIA spectrometer high flexibility for different measurement scenarios. Currently used is a 128 x 48 pixel read-out area with a spatial sampling of roughly 140 m (@10 km tangent altitude and for a flight altitude of 15 km).Typically GLORIA is either programmed in the Dynamics Mode with high temporal and thus high along track spatial resolution but low spectral resolution or in Chemistry Mode with lower spatial but maximum spectral resolution.